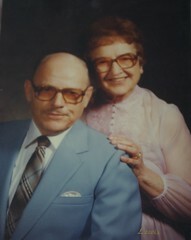 A few years ago I blogged about my Grandpa's sister, Opal. Long time readers might remember that some advice my dear Aunt gave me years agowas quite controversial. I truly never meant for it to be. 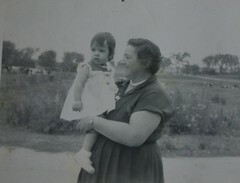 Whenever Aunt Opal spoke to me it was with kindness, sincerity, warmth and a bit of hmuor. In her later years there was a tinge of sadness as well. My Aunt Opal wrote me a beautiful letter that I wrote about here . I thought I had lost it but it was safely stucked away in my wedding bible and I just came across recently. In re-reading her words a few things stand out to me. First, it is never a waste of time or energy to reach out to older family members and friends. They truly appreciate hearing from us and knowing about our lives. Secondly, as you shall see from this letter, it is important for our children to see us practicing our faith and to see us in prayer. And lastly, to really enjoy our children, family and friends. They really are what fill our lives and our memories. I cant tell you how much I enjoyed your Christmas letter and those pictures. I am so grateful for my days are usually lonesome. I received two other form family letters, and glad for them, but the mirth and joy was seemingly lacking. I've read and reread yours over and over. Yuo must ahve help from Providence (pilgrim language) to be a wife, mom, teacher, cook, housekeeper all rolled into one. I don't know how my mom handled it every day for 30 years. Ivan was born in 1900 - Dorothy came in 1920. She was so even tempered. Well yes, I guess I DO know how she did it. I recall running upstairs for something and she would be getting off of her knees. That left a big impression on me and helped me when I had two children, a husband 500 chickens a garden and field helper when needed. I feel sorry about the time I had to drive the tractor, pull the hay baler- Paul was sitting on the baler unfortunately right over the aparatus that spring up and kicked the bundles out to the hay wagon. I didn't realize teh thing was in gear- a mixture of sorrow and humor was the issue- I couldn't help but laugh ( I am a professional giggler from way back), but he sure looked sour at me. Paul was so good helping me at house duties as if he was his mother's helper as well as his dad's. He had 2 baby brothers and 2 baby sisters who died in infancy so he knoew how to dust etc. I got a nice letter from Ray Leckrone's wife, Gen - she sent a clipping for me to share with Grace and Dorothy. Janet Sue recited it in the adult SUnday School class when the subject of "Women inthe Bible" surfaced. Once a month Craig, Debbie and baby come up and Lisa and baby girl and my sisters and I and Janet and Don meet at the Pizza Place for pictures, pizza and visitation. It's my big hour. Tell your Mom I think of her so often and will write to her soon.